With each show seen here at Village Theatre, you are witnessing the arduous and meticulous results of artisans who put hours into perfecting their craft. Each show is custom designed from the ground up and we are proud to say that our team of master craftsmen includes some of the best painters, carpenters, seamstresses, and engineers in the region. We will be celebrating these artisans throughout our upcoming 2014-2015 Season playbills and are excited to start by showcasing our incredible scenic artist team, led by Master Scenic Artist Julia Franz. Funny Girl is Julia’s 100th Mainstage show— and ironically enough, the very first show she worked on at Village 20 years ago. 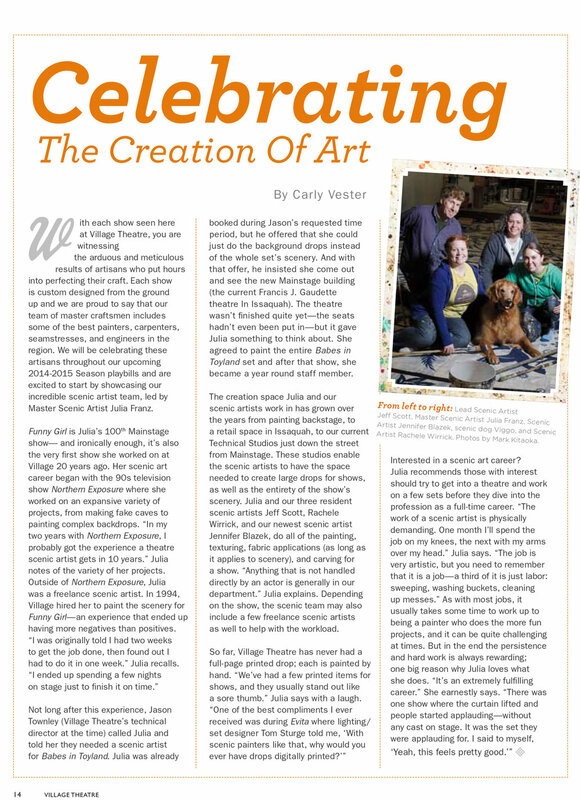 Her scenic art career began with the 90s television show Northern Exposure where she worked on an expansive variety of projects, from making fake caves to painting complex backdrops. “In my two years with Northern Exposure, I probably got the experience a theatre scenic artist gets in 10 years,” Julia notes of the variety of her projects. Outside of Northern Exposure, Julia was a freelance scenic artist. In 1994, Village hired her to paint the scenery for Funny Girl — an experience that ended up having more negatives than positives. Not long after this experience, Jason Townley (Village Theatre’s technical director at the time) called Julia and told her they needed a scenic artist for Babes in Toyland. Julia was already booked during Jason’s requested time period, but he offered that she could just do the background drops instead of the whole set’s scenery. And with that offer, he insisted she come out and see the new Mainstage building (the current Francis J. Gaudette theatre you are sitting in right now). The theatre wasn’t finished quite yet—the seats hadn’t even been put in—but it gave Julia something to think about. She agreed to paint the entire Babes in Toyland set and after that show, she became a year round staff member. The creation space Julia and our scenic artists work in has grown over the years from painting backstage, to a retail space in Issaquah, to our current Technical Studios just down the street from Mainstage. These studios enable the scenic artists to have the space needed to create large drops for shows, as well as the entirety of the show’s scenery. Julia and our three resident scenic artists Jeff Scott, Rachele Wirrick, and our newest scenic artist Jennifer Blazek, do all of the painting, texturing, fabric applications (as long as it applies to scenery), and carving for a show. “Anything that is not handled directly by an actor is generally in our department,” Julia explains. Depending on the show, the scenic team may also include a few freelance scenic artists as well to help with the workload. So far, Village Theatre has never had a full-page printed drop; each is painted by hand. Interested in a scenic art career? Julia recommends those with interest should try to get into a theatre and work on a few sets before they dive into the profession as a full-time career. As with most jobs, it usually takes some time to work up to being a painter who does the more fun projects, and it can be quite challenging at times. But in the end the persistence and hard work is always rewarding; one big reason why Julia loves what she does.